Thala Ajith's Gautham Menon directed Yennai Arindhaal audio composed by Harris Jayaraj is all set for the grand release on 1st of January. Anushka and Trisha are playing Ajith's love interests in this movie produced by AM Ratnam's Shri Sai Raam Creations banner. The wait is all over. 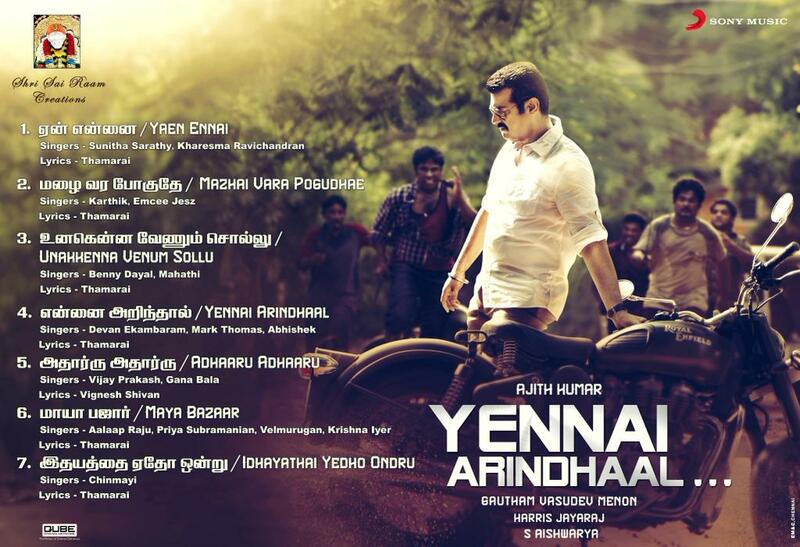 Yennai Arindhaal soundtrack list is here... The album comprises 7 songs penned by lyricist Thamarai barring the Adhaaru Adhaaru number, which is by director Vignesh Shivan. The songs are as follows- Yaen Ennai by Sunitha Sarathy and Kharesma Ravichandran; Mazhai Vara Pogudhae by Karthik and Emcee Jezz; Unakkenna Venum Sollul by Benny Dayal; Mahathi, Yennai Arindhaal by Devan Ekambaram, Mark Thomas, Abhishek; Adhaaru Adhaaru by Vijay Prakash, Gana Bala; Maya Bazaar by Aalaap Raju, Priya Subramanian, Velmurugan, Krishna Iyer & Idhayathai Yedho Ondru by Chinmayi. Music for the album is by Harris Jayaraj, who has teamed up with Gautham Menon after a long time. The audio will be out on the December 31 mid-night and the CDs will be available at the stores on January 1.